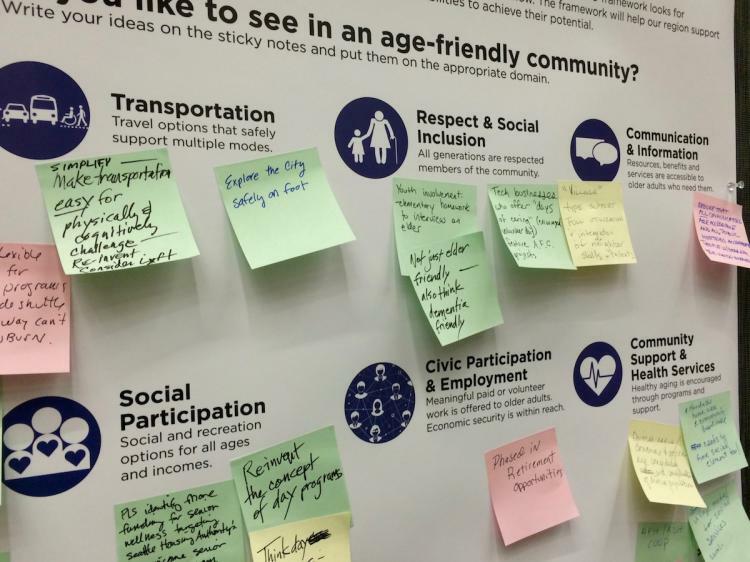 We've brought back some highlights of the recent 5th annual UW Elder Friendly Futures Conference. The diverse slate of speakers shared developments in Alzheimer's disease research, useful clinical insights on the use of Vitamin D supplements and antidepressants, ideas for dementia-friendly arts programs, lessons on how stigma perpetuates—and much more. Dr. Tom Grabowski, Professor of Neurology at UW Medicine, started his science talk by clearing up a “fundamental and pervasive confusion in our society and the medical community between Alzheimer disease and dementia.” Recognizing their distinction has wide-ranging implications. In short, Alzheimer's disease names the biological process by which amyloid plaques and tangles of tau protein build up in the brain's medial temporal lobe and eventually spread throughout the entire brain. He explained that amyloid can begin to accumulate in the brain up to 30 years before symptoms of memory loss and cognitive impairment appear, about 15 years later on average. Only in later stages of the disease does a person become dependent on the care of others to perform activities of daily life, a state called dementia. For perspective, while 1% of people aged 65 have Alzheimer-type dementia, 25-30% of adults aged 65 show amyloid build-up in PET scans. According to the National Institute on Aging, the prevalence of clinically diagnosed Alzheimer's disease doubles every 5 years beyond age 65. Some people with these signs of pathology escape developing symptoms during life, and researchers are now on the hunt for the genes or aspects of life history that contribute to this resilience. 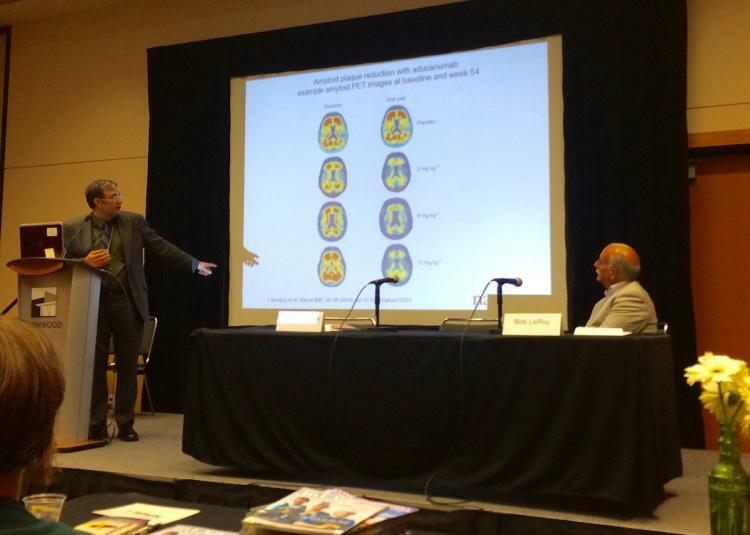 In Dr. Grabowski's framing of Alzheimer's disease, the long presymptomatic phase becomes a wide window during which lifestyle modifications in diet and exercise, and eventually, future therapeutics, can help improve or maintain cognitive function or delay dementia onset for many years. “So, if our plan is to advance the day when we prevent these threats to brain health, we really are going to have to intervene early, either with a strategy of primary prevention based on identification of early amyloid burden and genetic factors, or secondary prevention methods to treat early symptoms,” he said. He noted that the vast majority of older adults over 65 with early to mid-stage dementia symptoms typically have the capacity to live meaningful and engaging lives for many years in spite of the impairments. He also shared the results of a new study that shows, for the first time, a dose dependent response to the investigational therapeutic aducanumab. The drug demonstrated an ability to clean out amyloid from the brain and potentially improve cognitive function in Biogen's EMERGE study of participants with early stage memory loss due to Alzheimer's disease. To learn more about the EMERGE study, please see our Clinical Trials page. There was an update on the progress of the WA Alzheimer's State Plan, which sets out goals for future legislation aimed at smarter ways to handle dementia in the national social health insurance program. 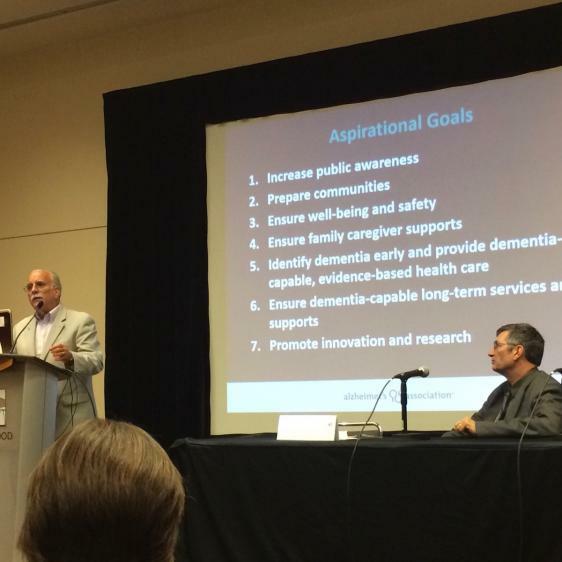 Here's Bob LeRoy, Bob LeRoy, Executive Director of the Alzheimer's Association, Washington State Chapter, presenting the"Aspirational Goals” for improving implementation of new guidelines for prevention, early detection, treatment, and all aspects of life in the community for those living with dementia. He said he's particularly excited that WA state government officials are throwing support behind this plan. “We have some real legislative champions in Olympia, and they sure know a lot more about Alzheimer's disease than they did 3 years ago.” Many UW researchers and staff members currently participate in the State Plan as part of the Dementia Action Collaborative committee, including UW Medicine's Memory and Brain Wellness Center's Dr. Kristoffer Rhoads, Marigrace Becker, and Dr. Suman Jayadev, and UW School of Nursing's Dr. Basia Belza, Dr. Tatiana Sadak, and Dr. Rebecca Logsdon. 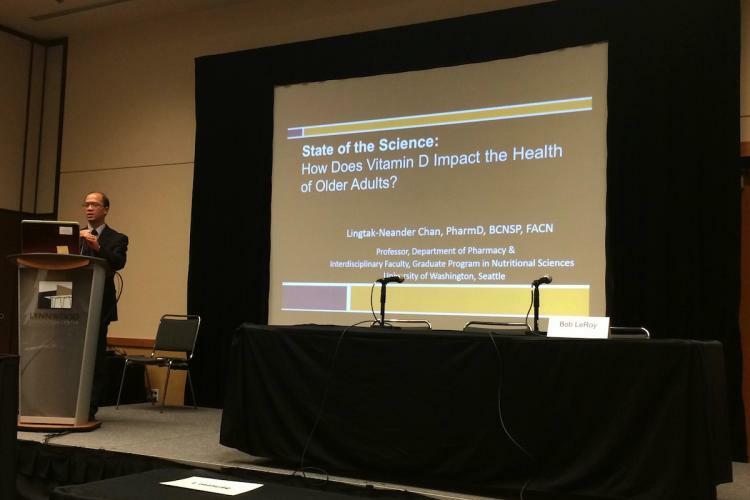 Dr. Lingtak-Neander Chan of the UW School of Pharmacy gives an update on evidence-based use of Vitamin D for older adults. Vitamin D has well-established benefits for bone health, and clinicians logically wonder if increased doses of Vitamin D can lead to improved clinical outcomes for adults and the geriatric population in areas such as fracture risk. Dr. Lingtak-Neander Chan, Professor and Vice Chair of the UW Department of Pharmacy, drew from the results of many clinical research studies, showing that any dose beyond the standard 800 IU per day does not significantly prevent fractures, falls, or cardiovascular risk factors. In fact, four separate studies show that doses over 50,000 IU given every 3 months, 6 months or year actually increase the risk of falling. 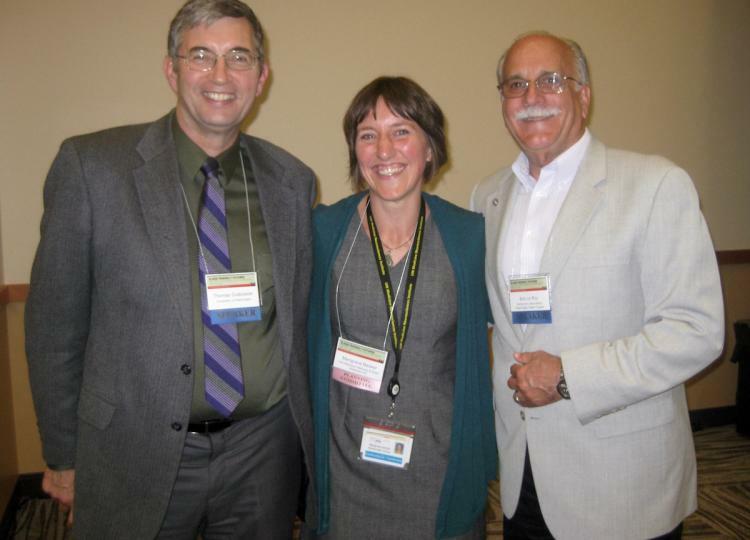 Several faculty members in the UW Department of Psychiatry and Behavioral Sciences spoke on the panel, 'New Insights on What Works and Doesn't Work in Geriatric Mental Health'. In a talk on psychotropic medications, Dr. Stephen Thielke reported that evidence doesn't support the use of antidepressants in older individuals with symptoms of anxiety or mild depression, and only show benefit for patients with major depression. In a related talk, Dr. Patricia Areán pointed out that antidepressants don't seem to help a subset of individuals with a type of late-life depression that causes impairment in concentration, focus and decision-making. For this patient population, she is helping to design therapeutic video games that show potential to improve mood and cognitive function. Learn about all of her projects in the Personalized Interventions for Mental Health (PIMH) program. Dr. Emily Trittschuh shared her insights into the best ways to detect and care for older adults, particularly veterans, with post-traumatic stress disorder (PTSD). She emphasized that many treatments can be used safely in older adults with PTSD with co-morbid psychiatric disorders, and even those with mild cognitive impairment or early dementia, including prolonged exposure therapy, cognitive behavioral therapies, service animals, and the pharmacotherapy prazosin, which can improve sleep quality. Amy Harris, Recreational Therapist, shared her experience leading the 2015 Creative Connections Project, in which she facilitated art making experiences for people living with memory loss or dementia. Photographer Monica Jane Frisell created the project's lasting legacy in these black and white photographs, which reveal the impact of the creative process in enhancing meaningful exchange with these artists. She shared a memory of when one participant, whose sister had died of heart disease, produced a painting of green vines growing around a heart. 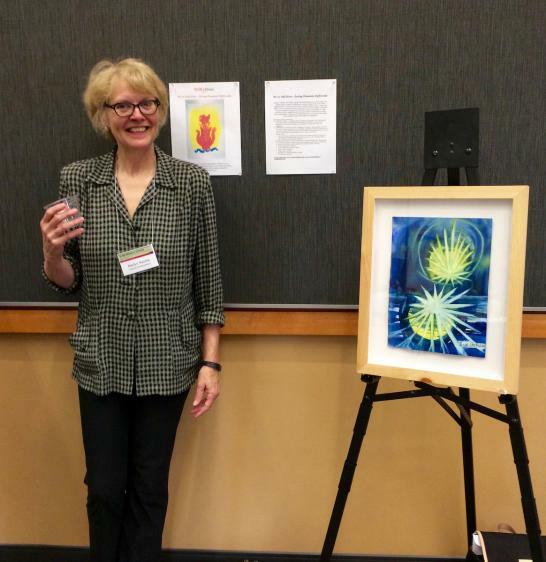 Marilyn Raichle made sure that paintings from the Art of Alzheimer's exhibit decorated the conference hall. 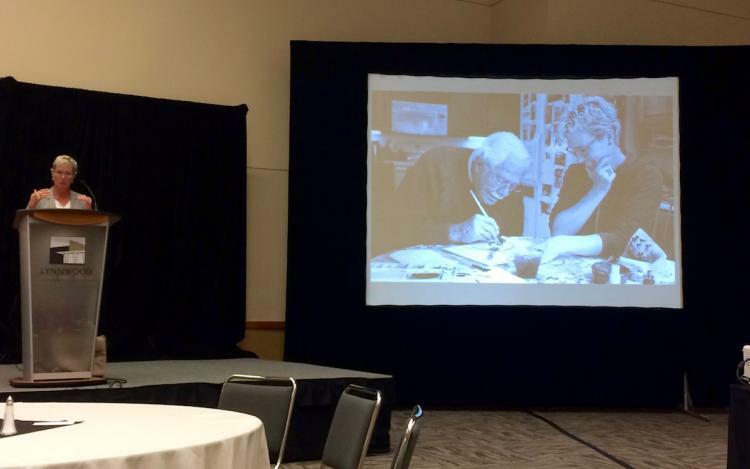 Driving home the potential of arts opportunities for those living with memory loss, Dr. Lee Burnside, Clinical Assistant Professor at UW Medicine, shared the findings of a research study on the Frye Art Museum’s here:now arts engagement program. He explained that the interactive art museum tours and studio art classes, by encouraging mindfulness and social connection, leads to improvements in the quality of life and relationships for the participants. In another highlight of the conference, Dr. Deborah O’Connor, Co-Director of the Centre for Research on Personhood in Dementia at the University of British Columbia, shared her insights into the experience of stigma for persons with Alzheimer's disease and dementia. She drew on knowledge gained from her time spent with an advisory group of people who are informing research on what it means to live well with dementia. Listening closely to the participants, who were unaccompanied by their care partners and unprompted in conversation topic, she found that stigma emerged as a critical factor. For some, disclosing their diagnosis led to negativity and fear around the medical news or being treated differently – that’s stigma. In this situation, a person with memory loss or dementia can, over time, come to internalize these negative feelings and feel responsible or deserving of the judgmental reactions. However, being able to identify a reaction as stigma can empower people to advocate for themselves rather than feeling guilty or ashamed. 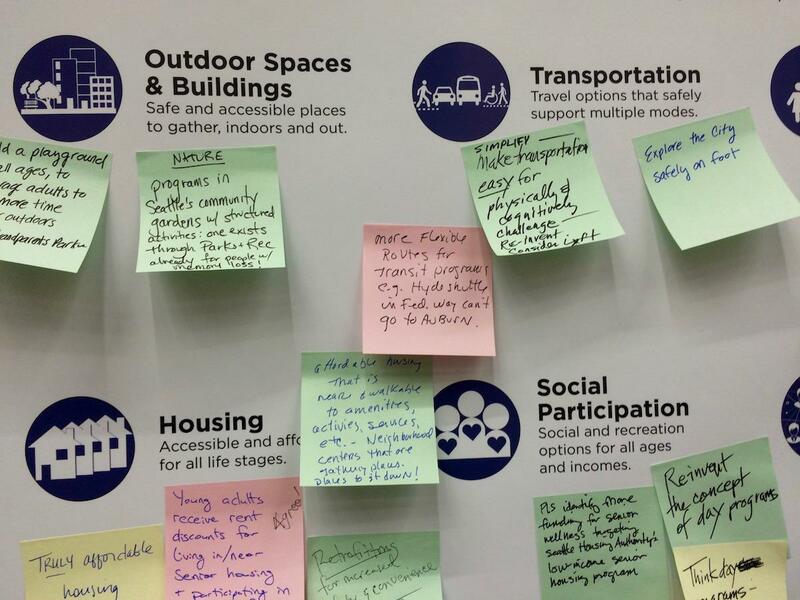 We often hear about “combating stigma” in the world of Alzheimer's advocacy, but the roadmap towards that goal is not always clear. Dr. O'Connor articulated this common human reality and how recognizing the personhood of people with dementia is a critical element of building dementia-friendly communities—a foundational principle of MBWC's program Our Time Has Come. The UW Elder-Friendly Futures Conference is sponsored by the UW School of Nursing de Tornyay Center for Healthy Aging and the UW School of Social Work, in partnership with the UW School of Pharmacy and the UW Division of Gerontology and Geriatric Medicine Northwest Geriatrics Workforce Enhancement Center. 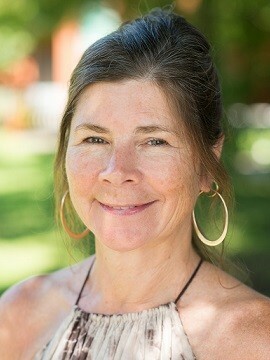 Marigrace Becker, Program Manager of Community Education and Impact of the UW Memory and Brain Wellness Center served on the 2016 Conference Committee.